The Climb Pro Glide skins by Pomoca are a 70%/30% blend of mohair/nylon which is quickly becoming a standard ratio in ski mountaineering. The blend makes for a great balance of grip, glide, and durablity. Pomoca recommends these skins for mountain guides and experts, but we think everyone should experience the speed of the versatile blend with Pomoca's custom fiber treatment. These come with a ready2Climb attachment set that consists of a replaceable tip buckle and Back Fix tail clip. Uses special Pomoca nylon fibers that are quick drying with resistance to twisting and abrasion. Features a new tip buckle that can be swapped to fit any width ski (2 sizes included, others available). The climbing skin fibers are treated with a Pomoca Glide process that reduces friction. Simple Back Fix tail clip lets you fine tune the tension so your skins stay on. Ever Dry anti-glopping treatment and a waterproof membrane make these safe to use in wet conditions. 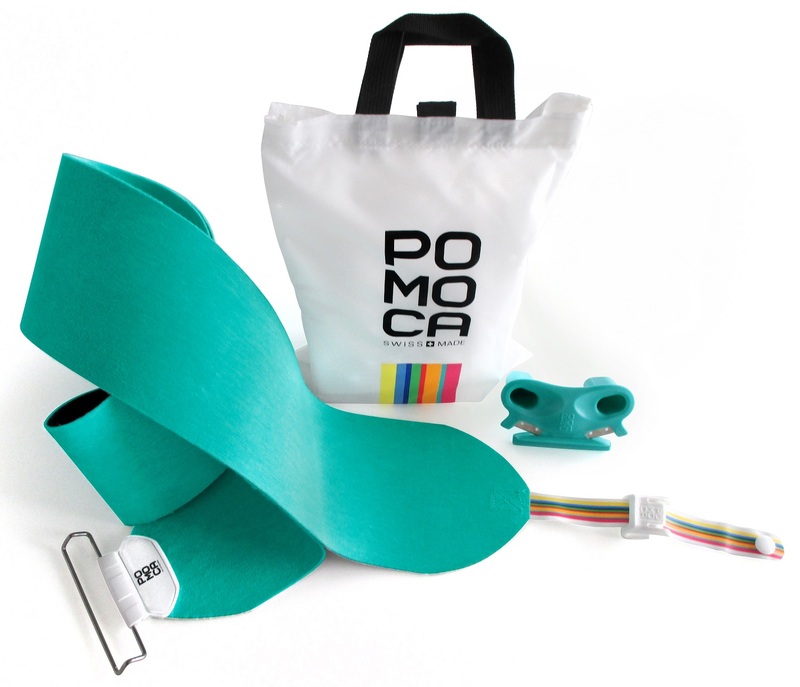 Includes easy-to-use (puts other cutters to shame) Pomoca cutter with two blades and a Pomoca storage bag. I have an older pair of these skins and I really like them. I am pretty careful with my skins and I found the glue failed me much faster than other skins I've owned and faster than less careful friends glue. I'll probably buy another pair anyways but I am curious whether it was just me or if this was a known issue Pomoca has addressed. These were the version with the rainbow tail straps. Hi Doug, since your skins were made, Pomoca has definitely revised the glue formula which may help. Pomoca's newest glue formula is one of my favorites. It's not to hard to pull apart or remove, fairly resistant to icing up, and I usually get a full season before re-gluing. Depending on the brand your friends are using, there are some other glues that seem to last longer before needing to refresh, but they have more drawbacks in my opinion. Hey Sather, thanks for reaching out! Good work, putting a tip notch in a ski that otherwise doesn't have one is a SkimoCo approved modification! These will be great skins for your Vector as it's one of our most popular skins we have ever sold (possibly the most popular, but I can't verify that for sure). Unfortunately, we won't be able to trim the skins for you, however the Pomoca cutter is by far the easiest and most intuitive to use. From untrimmed and in the box to trimmed and on snow it only takes about 5 minutes. These skins are highly recommended! I’ve used the version branded and cut specifically for the Nano. I have the La Sportiva proprietary attachment system so I can’t comment on the universal Pomoca attachments. But Five Stars overall for typical Euro momix glide combined with good yet not overly tacky glue. The laminate is though relatively “boardy” for this type of skin, which can be either a plus or minus depending on your perspective. See my full review under the La Sportiva version for more details. What size would you recommend for the Blizzard Zero G 95 in 178cm? It's dimensions are 128 / 95 / 111.5. Thanks! Hi Kevin, you want the 120mm x 166-177cm. Enjoy! Thanks for the info. One more follow up - how do these compare to the pre-cut Pomoca skins that Blizzard sells for the Zero G? Hi Kevin, we're told by Pomoca HQ that the Blizzard skins use the Race Pro formula, so in theory would be lighter and more glide-y. I am wanting to use the 100 mm 166 cm to 177 cm for a 175 cm BD Helio 105. I am currently using 100 mm G3 Alpinist. Just looking for a lighter skin that grips as well and glides better. Is Pomoca Climb Pro Glide the one? Will the 80 mm tip loop work okay? Hi Eric, yes the CPGs have good grip and great glide. Obviously you'd get more grip with a wider skin. The 95mm loops are probably better for that ski. What size do you recommend for a pair of 178 DPS Lotus 120 Spoons? I'm thinking the Medium 140x166-177. Hi Andreas, I haven't tested the spoons but you should be able to go a couple cm short on that, so it sounds right to me. Thoughts on the right size for a DPS Wailer 112 RP2 Pure 3, 178 length? Thanks. Hi Adam, the 166-177s seem to fit best on those. would the pomoca climb pro (all mohair) be as good as the climb pro glide (70/30 mohair/nylon) ? what size should i order for those skis? Hi Mike, the grip and glide is fairly comparable between those. The mohair packs up better, the mix is a bit more durable. But you should order the Dynafit skins, which have the tip and tail attachments for the Denali. 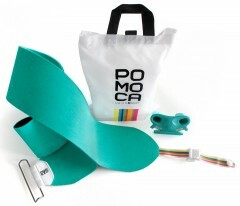 They are made by Pomoca and consist of approximately the Climb Pro Glide formula. What size would you recommend for the new DPS Wailer 106, in the Tour1 Construction? Hi Moops, I'd do the 120mm wide skins for full coverage in the tail where it's important, and let you glide a bit more in the tip. The 140s would give you max grip. I have a pair of Fischer Hannibal 100 180cm. What size would you recommend and what would I need for the tip connector? Thanks! Hi PDS, I'd get the 120mm x 176-187. You can just use the square brackets that come with the skins. If you prefer to use the Fischer tip hole, you'd need to cut off the tips and put on some Contour hole adapters. What size skin do you recommend for Cham 97/178 cm? Hi Don, I'd go with the 120mm x 176-187cm. Not quite full coverage in the big rockered tip, but that's not very important since it's mostly off the snow anyway. The 140s would also work if you wanted every mm of possible friction. Hi, its possible to cut this skin and use the Pommoca race tip accesory to use bungee style in my race skis when need extra grip? Hi Gaby, absolutely. You can make a full coverage skin for race skis. It's probably cheaper to get some skin material off one of our rolls instead of buying a kit with a tip you don't want, but you certainly can sever these. what size would you recommend for my black crow camox freebird 177?? Hi svcci, the 120mm width would be ideal. You could use either the 166-177 (medium) length or the 176-187 (large). The former would save a bit of weight while the latter would have more coverage at the tail and leave more length in the tail strap for grabbing and peeling. i have salomon q-103 stella skis. 172 length waist 103 tip 122. what size would i need? Hi Karen, you'd want the 120mm x 166-177 for nearly-full coverage on those (I believe the tails are 122 and the tips 130). Unfortunately we are out of that size. BD Drift 176 cm ( 136 mm, 100 mm, 122mm)? Hi Geoff, I'm not sure how to tell the difference, but these came through the North American supply channels and all are current for this season (14/15). The 120s would be good for that ski; that provides full coverage in the tail where you get your grip. Full coverage in the tip is a bit excessive imho. Hi Kyle, it's a bit hard to objectively measure skin weight, since they come in tons of sizes and get cut differently for each ski. They also ship with various backing materials that affect out-of-the-box weight. This is a long winded way of saying I have no idea, but I can say they are much lighter than your average pile of nylon. Hi, what size tip buckles are included in the climb pro glide 120 and 140 skins? 100mm : 72mm installed, 80mm in box. 120mm : 95mm installed, 105mm in box. 140mm: 105mm installed, 95mm in box. Great product, used about 20 times. Offer the ultimate in glide and grip. I have also found these skins to be very good in conditions that would normally produce glopping. Glue is awesome, easy to rip skins, but doesn't fall off the base. Highly recommended. Have used these a few times in the Cascades. Did a few laps up on Hyak at temps right at 32 degF and some sleet and there was no gloppage. Good glide and light weight and the glue seemed to stick well to the skis, even after a few laps. Snow that did happen to get packed on the glue side was pretty easily removed by rubbing it on my nylon/softshell clothing. Also, separating the skins from themselves, even new, is a *lot* easier than new BD/G3 skins I've experienced in the past. The trim tool is fantastic!! So glad skin manufacturers are coming up with different ideas on these. Trimming was a 10-minute job and very clean. Minus one star for the tip loop attachment system on my skis. I think it would work great for skis with a sharp-ish tip, but I've got some Blizzard Kabookies with a fairly blunt tip, and they just kind of sit at the very end. I've been in touch with Pomoca and apparently they might make a wider bar next year which will alleviate the situation. They are working ok for now, so I'll wait for the wider bar rather than change to a different loop system, as I like the low-profile design of this system. I think they would work great on 95% of the skis out there that are <95mm and/or don't have a blunt tip. Tail attachment works well and is easily adjustable. Just an update on the tip loop - it looks like this year's system is vastly improved over the previous cable system, so please disregard my comments on that from last year. I have these custom cut to Movement Goldfish-X. I have used them for about 15,000 vertical feet and they have performed quite well. Great grip on any skin track I've been on and great glide on flat terrain and low angle slopes. I've had Dynafit Speedskins and these are exactly the same save for the tip and tail attachments. For reference my tips were replaced with top fix race attachments so that I can rip the skins off from the tip with skis still on. Jason at skimo did a great custom job on these!